FV 750 Indirect Fired Heaters use Reillo burners for all three fuel types - oil, propane and natural gas. VFD control helps regulate fan speed at start up and shut down, as well as providing motor overload protection and voltage management. The reverse inclined blower allows for outlet ducting over 100 ft. Pressurized design provides even airflow from both duct outlets. Oil units come with a Tiger Loop fuel draw and priming system standard. 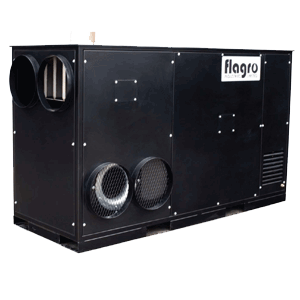 The FV 750 provides a 130 F temperature rise at 7,000 cfm. Return air duct inlet allows for recirculation of warm inside air. Features include insulated powder coated exterior panels and fully welded frame; integrated fork lift pockets and lift points, easy access burner, fuel lines and electrical controls. FV 750 is approved for indoor and outdoor installations. 4.5 x 60W @ 160 psi 1.5" W.C.
98" x 36" x 61" 98" x 36" x 61"